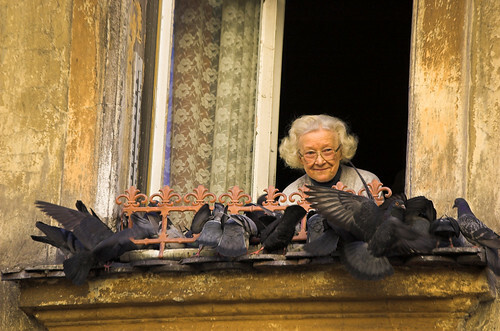 The Old Lady and the Birds, originally uploaded by closelyobserved.com. I was recently informed that my dearest friend, let’s call her Miss Sousa, as in a sousaphone, has never visited Pages Turned. Truth is, this bothers me not in the least. That’s the funny thing about being close with other book lovers – books are never mentioned. I am reminded of a piece in a previous piece in which it is said that a best friend shouldn’t ever tell a girl that she hates the other’s favorite novel. It is an unspoken rule, and to ignore it is to put your very life in danger. That being said, I am thankful that Miss Sousa and I have read only a dozen of the same books. We rarely discussed them or their authors or anything of the sort. Neither of us avoid it, but (and I hope she agrees with me on this) I don’t feel the need to educate her on the joys of reading or anything of the sort, unlike other company I’ve kept. The closest we get to such discussions are short little wisps of conversation. “Have you read this?” she asks. Why yes, I say with a smile, or, no, should I? I ask, making a mental note. Then I file it away in my endless mental book list, to let the idea get dusty and maybe be remembered, maybe. It’s a rare occasion when I actually pick up something after it has been mentioned, and I’m mostly sorry for this (but my budget isn’t). She brings out the fidgety old bat in me…ah, well. Does it wound my pride that the only other person in my life who could possibly understand my lust for Atticus Fitch has not read a single word I write? Not one bit, dear reader. Miss Sousa is better off not having to put up with my rants more than she has to. We share very little actually, be it fashions, ideas or genres. She is what balances me. During nights like this when my mind flits about, collecting thoughts to paste on this page, I think ridiculous things that I believe wholeheartedly – until the sun comes up. Perhaps friendship is the real marriage, and the friend a real soul mate. Maybe this husband and wife thing is just a necessary companionship a step above a personal secretary so we all have someone else to complain to about the love of our lives, our best friend. And this bunkmate with a ring is there to feign interest, if that… there to meet our needs, fills our time until Tuesday coffee when we can be our true self with someone who will buy cheesecake for our birthday and “help” us weed out the needless bits in our book collection. That’s love. Great blogging! I feel inspired to write myself. My wife… It’s taken me two years, but I’ve done it. I’ve visited this lovely site you temporarily devoted your life to. Naturally, this is my favorite post. I love you, too, NovelDame.